A thousand years from Earth. Still no sign of the new worlds. I trust the Shard. Its body protects us, its computers guide us, and its heart loves us. It loves each of the million weirdos on board whether robot, mutant, or something else. It loves us with every new mile of steel, stone, wire, and shell. But not the Boneheads. Nobody loves them. - Ra Silver, "The Hood Creed"
What's DIE BONEHEAD DIE! and why does my Sci Fi game have a stupid new name? I thought about what I wanted out of this game. As much as I love exploration, horror, and problem solving, I've got Into the Odd for that. 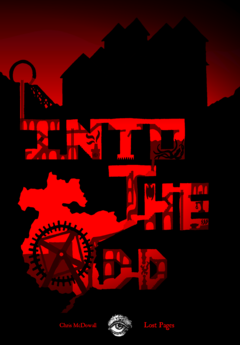 Into the Odd is a game of relatively normal characters going into strange places and getting freaked out. I want a game where you get to "be the weird". A playground for all of the creative ideas seen in WH40k/Rogue Trader, Red Dwarf, and Futurama. An unbound setting that isn't afraid to be silly. I want a game that leave no doubt as to what the characters should be doing. D&D is great because you can throw the party in front of a dungeon and say that there's treasure deep inside. I've always struggled with driving play in Sci Fi games, so this game has a concrete method for preparing the game and getting straight to the action. I want a game that's about encountering weird characters, creating big schemes, and taking risks. This isn't a game with precise tactical combat, or baroque character creation. I want a game that presents its setting through the game itself. No pages of exposition, but atmosphere and flavour laced into every rule and table. Just one key concept that you need to grasp (factions of mutants and robots on a huge ship far from Earth) before you can dive right in. I want a game that isn't just D&D's dungeon-crawling skeleton covered in a Science Fiction skin. Hopefully this game is on the first step to hitting this goals. Keep up to date with the ongoing development of the game document here.